Most of us spend a considerable amount of time every week doing laundry. For some, it’s a daily task, especially for those with young children. 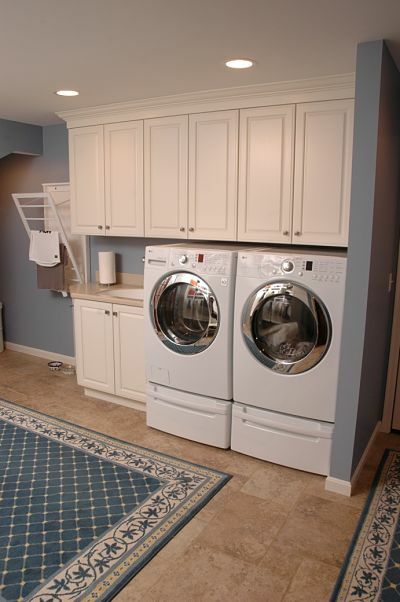 If you’ve wanted to re-organize the laundry room in your home, or perhaps move the machines up from the basement to a more convenient location, we have six great remodeling design ideas for making laundry day more efficient, pleasant and less of a chore. Mudrooms are often on homeowners’ “wish lists.” Every home can use a place where you can stop and drop muddy shoes and boots, backpacks, coats, hats and all of the attire we wear or carry with us each day. 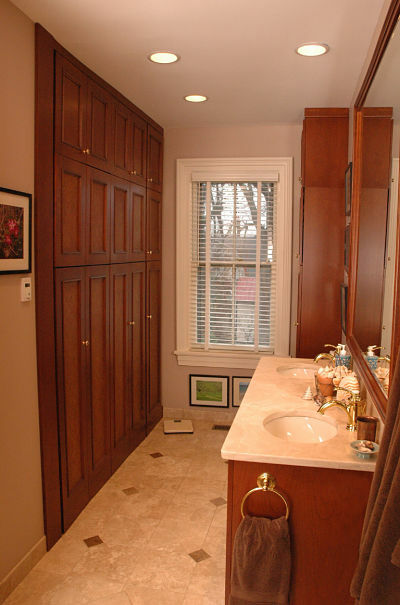 For these reasons, mudrooms are also a great place to house a laundry room. 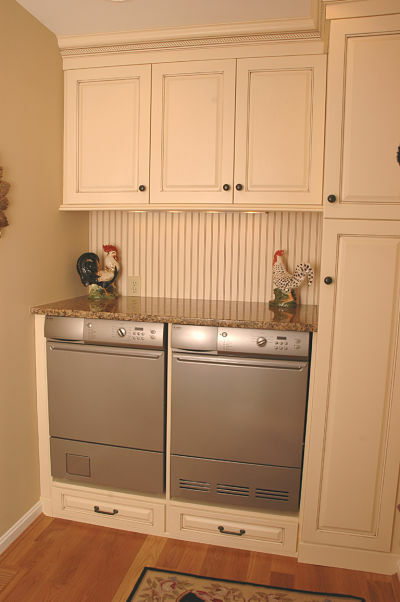 An entryway laundry room provides ample storage for cleaning supplies, a drying rack for sweaters and delicates and a solid surface counter with an integrated sink. The side-by-side placement of the washer and dryer, elevated by storage drawers, reduces back stress when loading and unloading laundry. A tile floor keeps dirt, grime and spills in check. The white cabinetry, blue walls and rugs create an attractive room to work in. This mudroom/laundry room entry includes built-in cubbies with hooks and shelves for organizing the “drop zone.” There is a pull down drying rack just inside the door that provides a place for wet mittens, hats and even an umbrella. When remodeling a kitchen, more homeowners are considering creating a convenient spot for doing laundry in an adjacent back hall or closet, a pantry area or placed within the kitchen hidden by cabinetry. 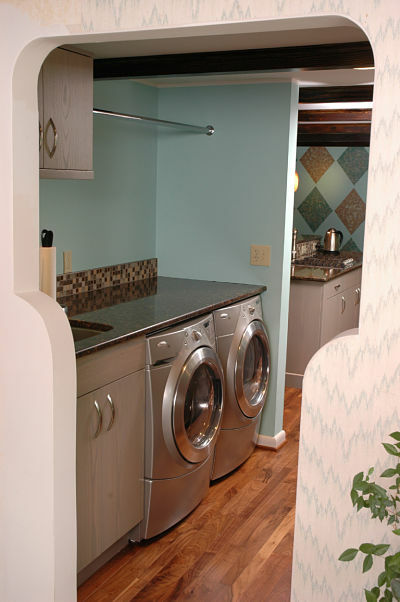 A back hallway off of a kitchen was creatively and efficiently designed as a laundry room. Side-by-side front loading machines were placed below a counter that includes an undermount stainless steel sink. Cabinet storage is sufficient for laundry supplies and there is a bar for hanging delicates and knits to dry. The counter provides space for a laundry basket and for folding and sorting clothes. Laundry closets are gaining popularity. Why? They can be located in a hallway, bedroom, bathroom or kitchen. They are compact and efficient. 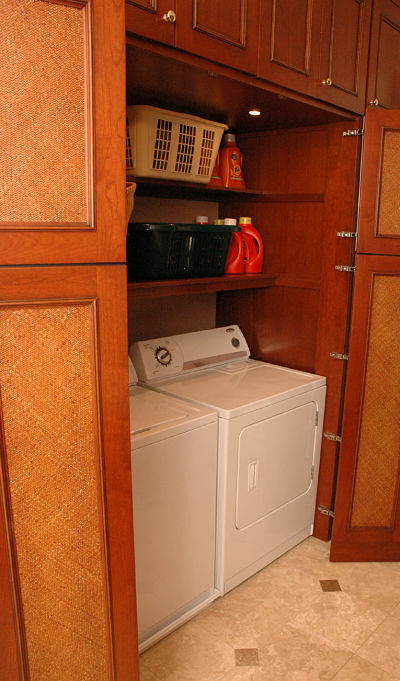 Laundry closets are great for small homes, condos and apartments. Close the door and the contents are hidden from view when not in use. Puck lights can be added for illumination and shelves can be fitted to the closet for keeping supplies on hand. 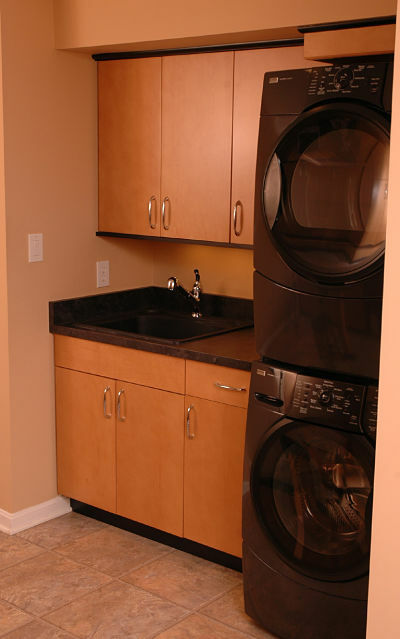 A built-in laundry closet located in a long narrow bathroom camouflages a top loading washer and a front loading dryer. Shelves provide storage for baskets and detergents. Puck lights illuminate the closet. When closed the closet blends into the wall. The bathroom sink does double duty and serves a place for pre-treating stained items or hand washing delicates. Front loading machines can be outfitted with pedestal drawers to increase the height and make loading and unloading items easier. When controls are on the front of the machine a counter can be laid over the top to create a work area. 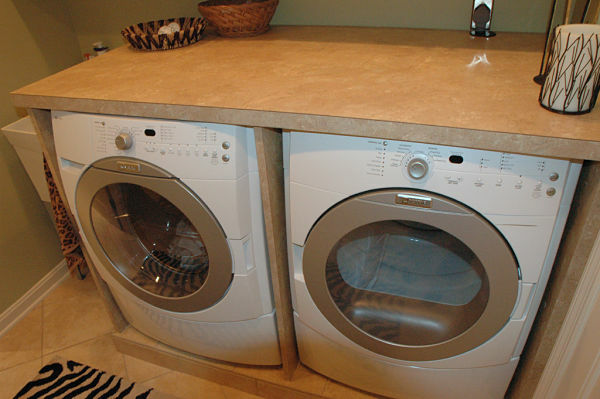 Depending on your preferences counter surfacing can be laminate, solid surface or stone. A simple laminate counter creates a workspace when placed over side-by-side machines. A utility sink is in the left of the photo. The space is small and the combination provides an efficient cost-effective solution. A quartz counter placed over the washer and dryer integrates a sink to form a corner workspace in a mudroom entryway. 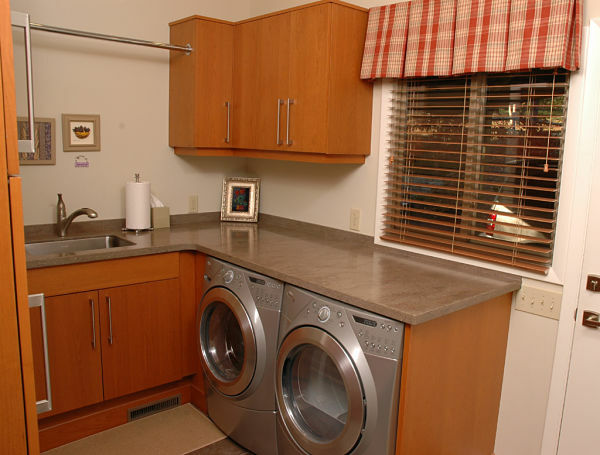 Granite was used for this laundry area located in a kitchen pantry. When shopping for a washer and dryer, you will find conversion kits for some front loading models that allow them to be stacked. There are also smaller space saving washer/dryer combinations on the market that may have less capacity but will efficiently fit into closets and other small spaces. A stackable washer and dryer conserves space in this laundry area and allow for the efficient placement of storage cabinets and a sink. If you have the room, consider a cleaning station where you can wash a dog, rinse mud off shoes and boots, or even clean large items such as screens and outdoor furniture. A cleaning station is a mini-shower complete with a shower base, tile surround and a handheld showerhead. 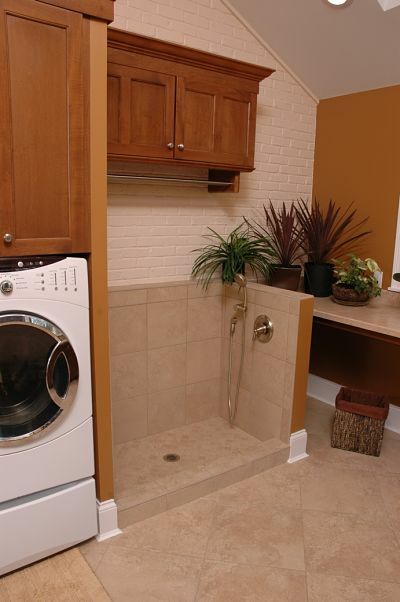 This laundry room was built as an addition. There was sufficient space for a cleaning station where the family dog could enjoy a quick and warm shower. The station can also be used for potting plants. Slip-resistant tile was used for the base and flooring.